Looking to extend the holidays a bit further, we set out for the Hawthorne Hotel last Sunday. Nathaniel’s, the hotel’s main restaurant, features a Sunday Jazz Brunch and recently changed from a buffet to a prix fixe menu, giving us the perfect excuse for a last indulgent meal of the season. And that it was, from the service to the setting to the food. For $16.95, we were each able to choose from a large selection of salads, entrees, and sweets. For salads, we sampled the arugula with smoked salmon with ricotta salata (delicious), the spinach with bacon and hard-boiled egg (equally good), and the caesar (good but slightly overdressed). The entrees run the gamut from sweet to eggy to more-lunch-than-brunch. We were very happy with the flavorful harvest pasta (also available as a vegan dish), the meatloaf with mashed potatoes, and the harvest frittata, which was cooked perfectly and topped with an abundance of asparagus, spinach, onions, and Vermont goat cheese. 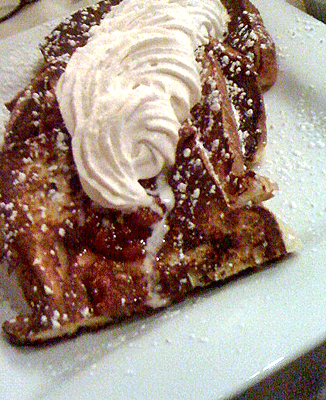 The runaway hit was the brioche french toast, which was just crusty enough and topped with a strawberry-rhubarb compote so delicious we didn’t even pick up the maple syrup pitcher. And yes, there might have been some whipped cream involved. To guild the lily, we sampled the buche de noel, a raspberry/cassis mousse, and an almond pear torte. All were great quality, with the torte being the favorite of the bunch. Note that coffee ($2.25) is not included in the prix fixe. The dining room is very well appointed, with enough sound absorption to keep the noise level of even a full room in check. We commend the service, which met our every need but never rushed our leisurely meal. 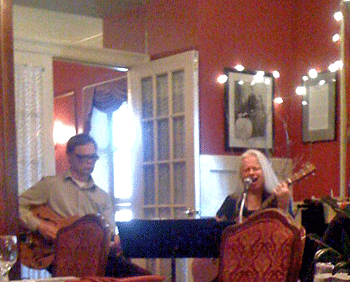 The jazz duo was also enjoyable, with classics given a welcome twist. If you plan to go, reservations are highly recommended, but feel free to bring children, who can choose from their own three-course menu for $9.95. For even more selection, kids or adults can choose from a substantial à la carte menu. 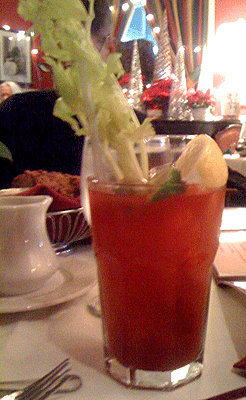 Also à la carte are cocktails ($7.75) like Bloody Marys and Greyhounds made from Gloucester’s Ryan & Wood vodka, gin, and rum or the interesting-sounding lemonsecco, featuring prosecco mixed with limoncello liqueur.